The trees evidently do well even when stressed for water. It's hard to find information about the nutritional and/or medicinal benefits of crabapple, but I was sure there would be some. 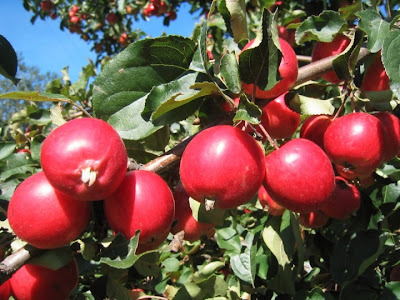 After all, they contain pectin, which is excellent for helping clear arteries, and fiber, and that pink color must be a source of antioxidants! Apples are one of the best sources of antioxidants, so it stands to reason that crabapples would be, too. ‘Antioxidant and antiproliferative activities of common fruits.’ Sun J, et al. Dept. of Food Science, Cornell Uv., Ithaca, New York, USA. J Agric Food Chem. 2002 Dec 4; 50(25):7449-54. That tartness in crabapples indicates lots of vitamin C, as well. I decided to use 12 cups to make a batch of crabapple butter in my slow-cooker, 2 cups to make a sorbet, and I froze the remainder for later. Both experiments turned out very well! So, if you can find someone who wants some crabapples taken off their hands, take them up on it! This is the most beautiful, tangy, mahogany-colored fruit butter! 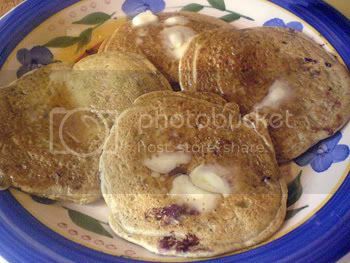 It would be delicious as a change from cranberry sauce with seitan roasts and cutlets, or on sandwiches and wraps. 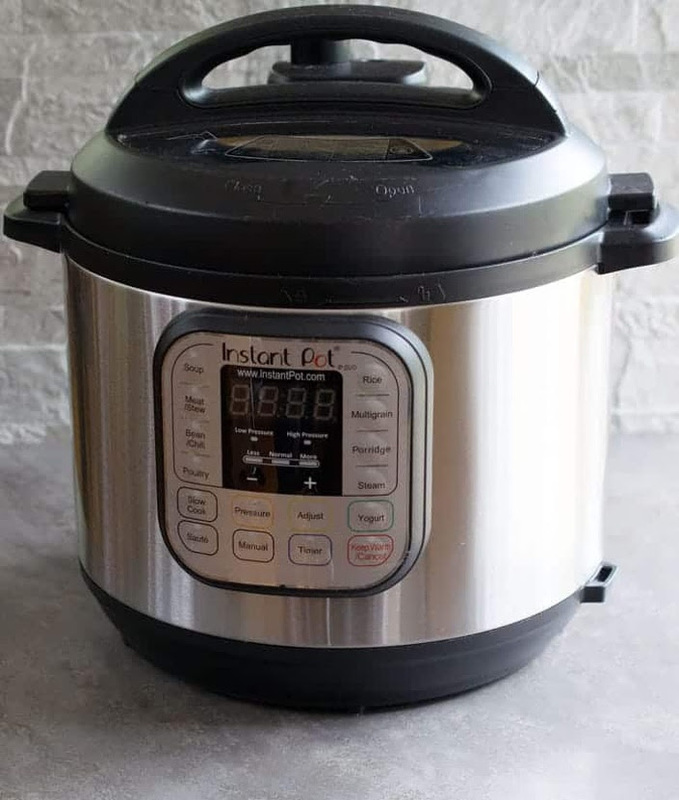 It's east to make in a slow-cooker because it doesn't require much attention and it will not scorch. I go easy on the spices because they can get too strong after long cooking. Combine all of the ingredients in a 6 qt. slow cooker and turn to HIGH. Cook with the lid off for 8-10 hours, or until the mixture thickens and cooks down by half. Stir the mixture throughout the cooking, every hour or so. 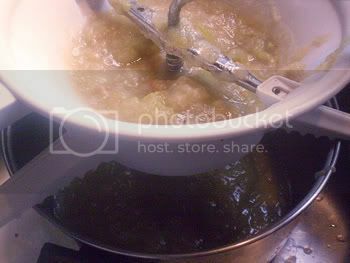 When done, the mixture should mound gently in a spoon, and when you place a spoonful of it on a plate, no liquid should exude from it. The mixture will be shiny and mahogany-colored. You can water-bath can the butter for 15 minutes in half-pint or pint jars. Nutrition (per 2 Tablespoons): 55.6 calories; 0% calories from fat; 0.0g total fat; 0.0mg cholesterol; 0.7mg sodium; 29.8mg potassium; 14.4g carbohydrates; 0.5g fiber; 10.4g sugar; 13.9g net carbs; 0.1g protein; 1.0 points. This is super-easy to make and not only beautiful, but tangy and delicious, too! Blend all of the ingredients in the blender until smooth. If the mixture is not cold, refrigerate it until it is. Process in your ice cream maker according to the directions in your manual. Scoop it out of the machine and place in a covered container. Freeze until firm before serving. 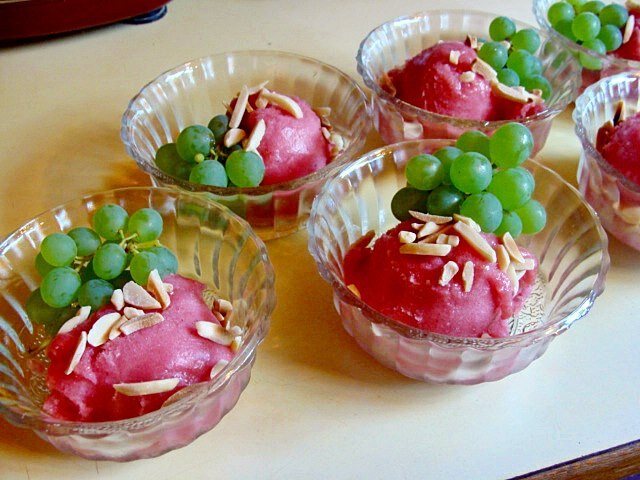 Nutrition (per 1/2 cup serving): 112.9 calories; 0% calories from fat; 0.1g total fat; 0.0mg cholesterol; 2.6mg sodium; 101.4mg potassium; 29.1g carbohydrates; 0.8g fiber; 16.7g sugar; 28.3g net carbs; 0.1g protein; 2.1 points. Zucchini Bisque-- delicious and uses up 2 1/2 lbs. of zucchini in one recipe! I use a food mill or mouli. There are a variety of them on the market-- mine is this one. Here's an all-stainless-steel one. 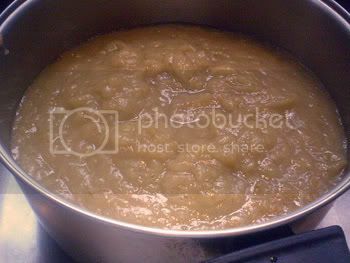 For smooth applesauce, you just wash the apples and cut them into quarters-- no peeling (unless there are bad spots), not coring, not stemming, even! Toss them in a big pot with a little water and cook until soft. This was a lovely salad and simple to make. I made some changes according to what I had in the house. 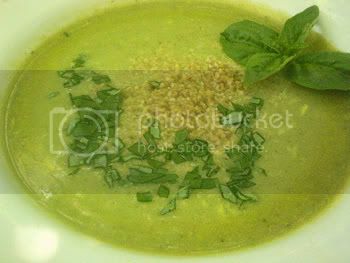 In a large, heatproof bowl, pour the boiling water over the bulgur. Cover the bowl and let stand until the water is absorbed, about 20 minutes. Meanwhile, bring a large pot of salted water to a boil. Add the green beans and boil over high heat until just tender, about 4 minutes. Drain and refresh under cold running water, then pat dry. Cut the green beans crosswise. In a small bowl, stir together the lemon juice and olive oil. 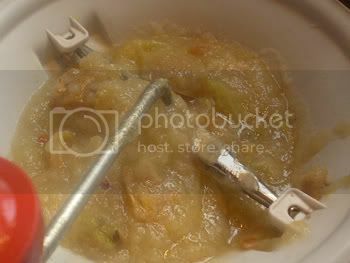 Fluff the bulgur with 2 forks. Add the green beans, tomatoes, almonds, mint (or basil) and lemon dressing. Season with salt and pepper and mix well. 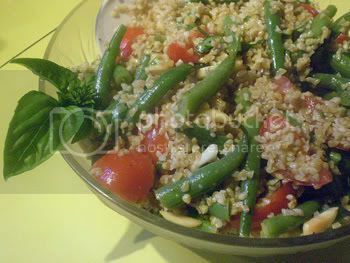 Transfer the bulgur salad to a large serving bowl and serve lightly chilled or at room temperature. The salad can be refrigerated overnight. Add the tomatoes, almonds and mint (or basil) just before serving. Nutrition (per serving): 237.8 calories; 37% calories from fat; 10.2g total fat; 0.0mg cholesterol; 12.1mg sodium; 371.0mg potassium; 33.9g carbohydrates; 9.4g fiber; 2.1g sugar; 24.5g net carbs; 6.8g protein; 4.8 points. As you might have noticed, I haven't done many desserts lately. I'm trying not to eat them very often! However, last night, despite the heat, I had a craving for a big, chewy cookie with chocolate chunks and whole pecans in it. So I made my recipe for chocolate chip cookies from my book "The Fiber for Life Cookbook " (it contains less fat than most recipes and is made with wholegrain flours), but I made fewer, larger, thicker cookies and I used whole chocolate couvertures (round "buttons" of chocolate for bakers and candy makers-- I used Camino organic, fair trade chocolate couvertures that I got from a wholesale supplier) and whole pecan halves. You could use chunks of your favorite vegan, organic, fair trade chocolate bar instead, or chocolate chips. UPDATE: I can no longer obtain those couvertures, unfortunately. I baked a small batch of them in my little countertop Cuisinart Brick Oven and it was just what I was craving! I baked the rest of the cookies early this morning, while it was cool. 6 tablespoons vegan butter (not whipped)-- try my palm oil-free vegan "Buttah"
Preheat the oven to 350°F. Line 2 cookie sheets with cooking parchment. 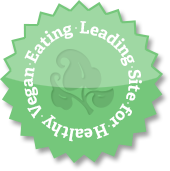 Beat the vegan butter, sugars, flaxseed egg replacer mxture, non-dairy milk, and vanilla in a food processor or with an electric mixer until smooth. In a medium bowl, mix the Dry Mix ingredients, whisking thoroughly. Add the processed mixture and and the chocolate and pecans, and mix well to make a firm dough. Chill the dough (covered) until firm enough to handle. Cut the dough into 16 equal pieces, and roll them roughly into balls with damp hands. Place 8 on each cookie sheet, leaving space between. Press them down to about 3/8" or 1/2" thick. Bake 10 minutes, then turn the pans around from front to back (and, if necessary, shift the ones on the lower shelf to the top and vice versa) and bake 10 more minutes. Remove from pans and cool on racks. Store airtight after cooling thoroughly, and freeze if you aren't using them up within a day or two. 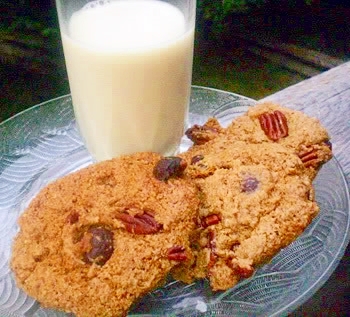 Low-fat cookies don't keep as well as the high-fat variety. 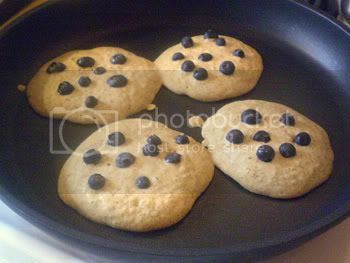 Nutrition (per cookie): 294.7 calories; 36% calories from fat; 12.8g total fat; 0.0mg cholesterol; 229.7mg sodium; 173.9mg potassium; 44.9g carbohydrates; 4.6g fiber; 19.8g sugar; 40.2g net carbs; 4.7g protein; 6.2 points. 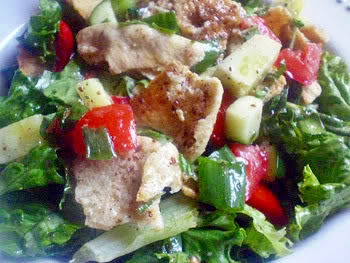 WHAT WE HAD FOR LUNCH TODAY-- FATTOUSH! 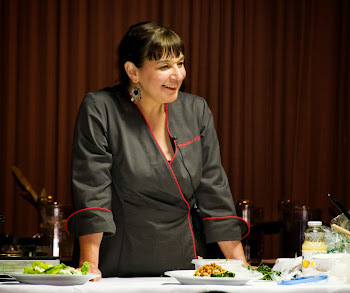 It has been a very busy week, so, for this blog post, I'm giving you a favorite recipe. I first tasted this salad at a Lebanese restaurant in Montreal and I was hooked for life! (Though usually encountered in Lebanese restaurants in North America, the salad is popular also in Syria, Palestine, Jordan, Israel and Iraq.) It is perfect for summer meals. The ingredient that makes it special is ground sumac, which is a berry from the Mediterranean Sumac tree. Sumac is deliciously tangy and sour with hints of lemon. Because of its flavor it is used as a souring agent instead of, or in addition to, citrus juice or vinegar. Sumac is found in Middle Eastern cuisine and it is an essential ingredient in Za'atar (a delicious spice mixture of sumac, sesame, thyme and sometimes other herbs). The seasonings of this salad will remind you of Tabbouleh, however it is distinctly different, and uniquely delicious. While it was originally invented as a way to use up stale pita bread, you can toast fresh pita bread for the same effect (sort of like making croutons). We often make a whole meal of this salad. Ground sumac can be found in Middle Eastern grocery stores (or see "Cooking Tips" below for online sources). 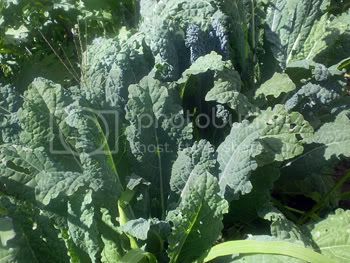 If you can find it, add the optional arugula (a peppery green leafy vegetable also known as rocket) and purslane (you may have to grow the last two yourself-- they are easy to grow), for a more authentic taste. 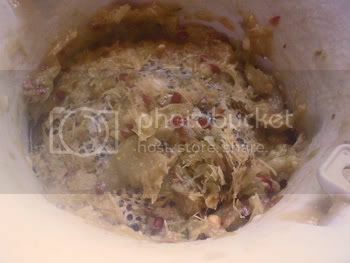 To make the Dressing, mix the dressing ingredients together with a blender, or with a whisk, or shake them in a tightly-sealed jar. Just before serving the salad, place the lettuce in a large bowl. Add the remaining vegetables and herbs, and the broken-up toasted pita bread. Add the Dressing and toss well. Divide the salad between 6 plates and serve immediately. Nutrition (per serving): 184.9 calories; 47% calories from fat; 10.1g total fat; 0.0mg cholesterol; 307.2mg sodium; 610.0mg potassium; 22.5g carbohydrates; 5.5g fiber; 4.6g sugar; 17.0g net carbs; 4.8g protein; 3.7 points. Sumac can be purchased at North African or Middle Eastern markets, or online vendors, such as amazon.com. (or search for "spice vendors USA"). GREENS, GREENS, GREENS, AND SOME LENTILS, TOO! I have to confess-- I am a terrible gardener! I love harvesting the fruits of the garden, but not growing them. However, we live on an island of gardeners, so there's no problem getting fresh, organic produce this time of year. 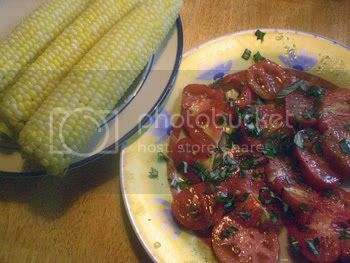 But, DH (who also doesn't like gardening much) always grows tomatoes and a few other things in our small garden. This year, the greens are just unbelievable! The kale and chard (2 kinds of each) are unstoppable! We are eating them almost every day, in large quantities. That's a good thing-- in my opinion, you can't eat enough greens! I usually just stir-fry ribbons of either one with a little olive oil, salt and garlic (no liquid-- they exude their own) until wilted-- absolutely divine! but yesterday I wanted to try something different. So I found an unusual recipe for a pilaf with more greens than grains ( 1 lb. greens) in it and decided to give it a try. 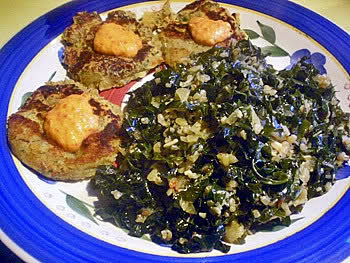 The recipe is from Food & Wine magazine, but created by Paula Wolfert, author several books, two of which are well-loved-- "The Cooking of the Eastern Mediterranean " and "Mediterranean Grains and Greens ". 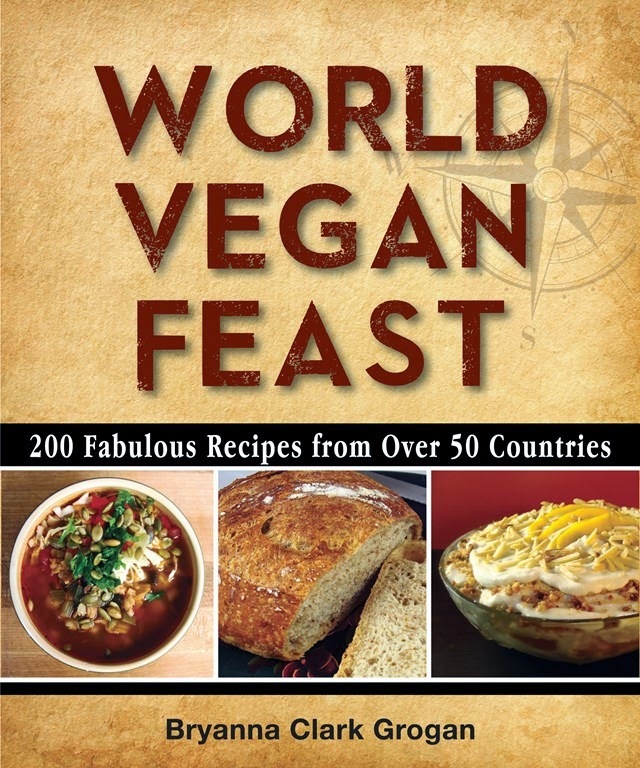 These books are not vegetarian, but there are lots of recipes and ideas for vegans, and the books are highly readable. The recipe has an unusual, but easy, cooking method. 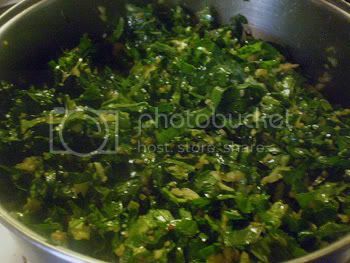 Very little water (1/2 a cup) is added, but the mixture steams slowly and uses the natural liquid from the greens to moisten the dish, so it's very nutritious, as well as delicious. I believe it's a Turkish dish. One of the ingredients needed for the dish is a Turkish red pepper paste, and I used a quick recipe of Ms. Wolfert's. I wanted something to go with the pilaf, so I chose a recipe for Turkish Red Lentil "Burgers" (patties, really), that I had made before, from fatfreevegan.com. I added a sauce utilizing the red pepper paste. (Recipes below.) It was a wonderful summer dinner! Not a great shot-- sorry! When I microwaved the leftovers today for lunch, the bulgur expanded some more, so maybe I should have let it cook longer. But it was good both ways! NOTE: Unless you have some ready-made, make the Quick Red Pepper Paste (recipe below) before starting this recipe. In a flattish bowl, mash the chopped garlic with 1 teaspoon of salt, using a fork. 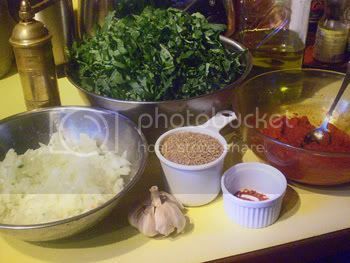 In a large, deep pot, combine the mashed garlic with the onions, mixed greens, bulgur, olive oil, red pepper paste, black pepper and red pepper flakes. Season with salt. Using your hands, work the water into the bulgur until it is absorbed. Scoop the mixture into the pot. Cover the greens with a paper towel. Serve the pilaf hot or cold, garnished with the green onions and lemon wedges. 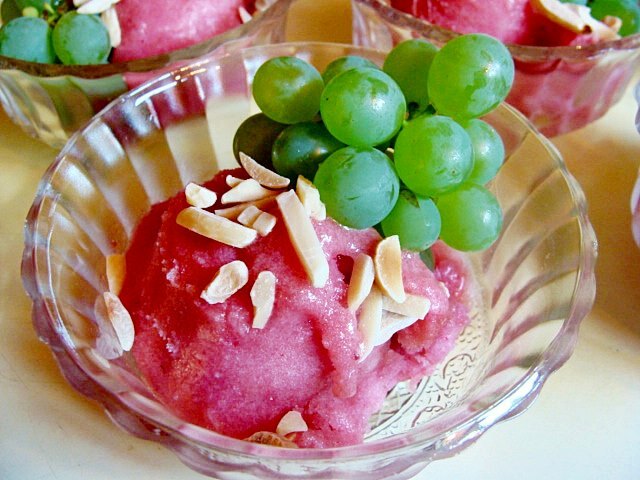 Grind everything in a blender or food processor until as smooth as possible. Scoop into a medium Pyrex bowl and cook on HIGH for 5 minutes. Stir and Cook 5 minutes more. Repeat until it reduces to about 3/4 cup. It will keep about 4-5 days in the refrigerator, but you can freeze "blobs" of it and store them in the freezer in a zip-lock bag. Simmer the lentils with the bouillon and water for about 15 minutes. When the lentils are cooked, all the water should be absorbed. If the lentils are watery, let them sit to absorb the rest of the moisture. When the lentils are cooked and relatively cooled (I scooped them onto a plate and put them in the freezer for a little while--BCG), add the parsley, garlic, onion, and spices. 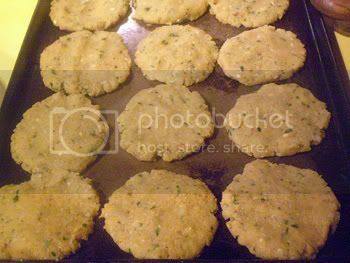 Shape the lentil mixture into small patties. Spray a large nonstick skillet with oil from a pump-sprayer. Cook the patties at medium heat until crusty on both sides. Be careful turning-- they are fragile. I served these with a mixture of my low-fat vegan mayonnaise mixed to taste with some of the Quick Turkish Red Pepper Paste (recipe above).